Today, for the first time in the history of Humankind urban dwellers outnumber rural residents. Urban places, towns and cities, are of fundamental importance – for the distribution of population within countries; in the organization of economic production, distribution and exchange; in the structuring of social reproduction and cultural life; and in the allocation and exercise of power. Furthermore, in the course of the present century the number of urban dwellers and level of global urbanisation are destined to increase. Even those living beyond the administrative or functional boundaries of a town or city will have their lifestyle influenced to some degree by a nearby, or even distant, city. The analysis of towns and cities is a central element of all social sciences including geography, which offers a particular perspective on and insight into the urban condition. The principal goal of this third edition of the book remains that of providing instructors and students of the contemporary city with a comprehensive introduction to the expanding field of urban studies. The structure of the first two editions is maintained, with minor amendments. Each of the thirty chapters has been revised to incorporate recent developments in the field. All of the popular study aids are retained; the glossary has been expanded; and chapter references and notes updated to reflect the latest research. This third edition also provides new and expanded discussions of key themes and debates including detailed consideration of metacities, boomburgs, public space, urban sprawl, balanced communities, urban economic restructuring, poverty and financial exclusion, the right to the city, urban policy, reverse migration , and traffic and transport problems. The book is divided into six main parts. Part one outlines the field of urban geography and explains the importance of a global perspective. Part two explores the growth of cities from the earliest times to the present day and examines the urban geography of the major world regions. Part three considers the dynamics of urban structure and land use change in Western cities. Part four focuses on economy, society and politics in the Western city. In part five attention turns to the urban geography of the Third World, where many of the countries experiencing highest rates or urban growth are least well equipped to respond to the economic, social, political and environmental challenge. Finally part six affords a prospective on the future of cities and cities of the future. New to this edition are: further readings based on the latest research; updated data and statistics; an expanded glossary; new key concepts; additional study questions; and a listing of useful websites. The book provides a comprehensive interpretation of the urban geography of the contemporary world. 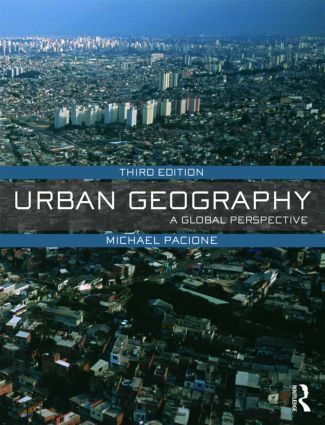 Written in a clear and readable style, lavishly illustrated with more than eighty photographs, 180 figures, 100 tables and over 200 boxed studies and with a plethora of study aids Urban Geography: A Global Perspective represents the ultimate resource for students of urban geography. Urban geography: from global to local Introduction Global trigger factors Globalisation Glocalisation: the localisation of the global The question of space and scale Local and historical contingency Processes of urban change Urban outcomes Why study urban geography?